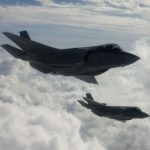 The Defense Department has given the Defense Manufacturing Technology Achievement Award to the team of Northrop Grumman and NLign Analytics for their work in support of the F-35 fighter jet. NLign Analytics said Thursday the award recognizes individuals’ technical accomplishments in support of DoD’s Manufacturing Technology Program. Northrop used NLign Analytics’ 3D collection and visualization software in an effort to reduce Material Review Board labor hours on the F-35 manufacturing line by 33 percent. The MRB process is designed to address flaws that occur when manufacturing aerospace components and help engineers decide whether to use, repair or scrap the components. NLign Analytics’ software works to align data to 3D models to support data visualization and analysis in a 3D environment. The Joint Defense Manufacturing Technology Panel presented the award to NLign Analytics and Northrop at the 2016 Defense Manufacturing Conference in Denver, Colorado. NLign Analytics is a division of research and development company Etegent Technologies.